Started in 1954 as a response to the less than desirable accommodations offered along route 66, Ramada Hotels with their friendly 'Uncle Ben' the innkeeper mascot and upscale reasonable amenities. Today Ramada is still known for offering the best at the best price and their bedding reflects that ideal perfectly. The Brentwood Gold by Martex is one of the most prolific down alternative pillows used in the hospitality industry for its support, soft feel and excellent lofty look. A tough and durable cover surrounds the 100% polyester filling making cleaning as easy as throwing in a washer and dryer. The high loft also offers excellent neck and spine support for side sleepers and the comfort is also just the right amount for back sleepers to find all night long rest. See the difference that quality hotel bedding makes in your sleep with the Brentwood Gold by Martex tonight and see why Ramada uses this pillow almost exclusively! The Ramada � mark is owned by Wyndham Worldwide Inc.; this trademark is not owned or licensed by HotelPillow.com. 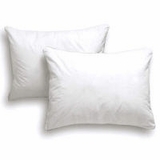 The Ramada � mark is used on this website for descriptive purposes to inform customers that the Brentwood Gold Label � Pillows sold by HotelPillow.com is the same down pillow found in many Sheraton � properties. 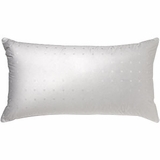 The Brentwood Gold Label � Pillow is not manufactured by Ramada or Wyndham Worldwide �.